Laser energy can be used to remove or reduce wrinkles, acne scarring, and improve skin texture and tone. This fully ablative laser treatment, that reaches the deeper layers of the skin, delivers the results and is most often used under the eyes and over the entire face. As the skin heals, the treated areas will be resurfaced with the growth of new, fresh skin cells, resulting in smoother, healthier-looking skin. 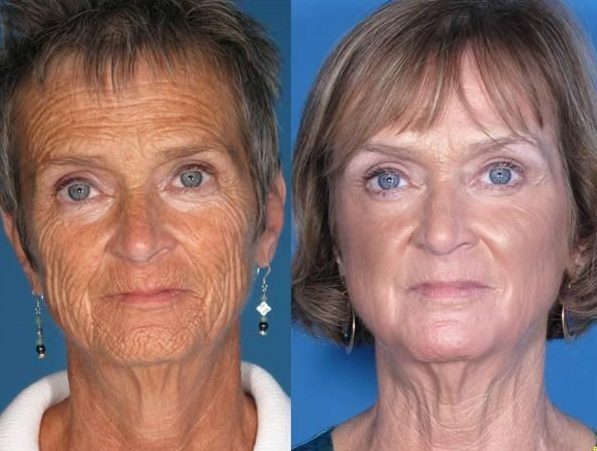 “CO2 lasering is a great procedure for someone with profuse facial wrinkles and for patients that are not candidates for surgery,” says Dr. Ricciardelli. He has over 25 years of experience. There is no substitution for experience and understanding when you are considering facial procedures. No two faces age alike and Dr. Ricciardelli’s approach will depend on the degree of aging changes. Can CO2 laser be combined with other treatments? Yes. The addition of Botox or Xeomin can help keep the skin from wrinkling again and fillers can restore volume. The combination of these treatments can maximize your results. Patients that are having eye surgery or other facial surgeries often combine resurfacing under their eyes to tighten the skin and reduce wrinkles. At your consultation, Dr. Ricciardelli will discuss your options and other procedures that you might be interested in having done at the same time. At your consultation, Dr. Ricciardelli will examine your face and neck, paying particular attention to facial structure, skin laxity and quality, and the degree of aging. Your goals and expectations will be discussed thoroughly. Often Dr. Ricciardelli will recommend that you start a skincare regime for before and after your procedure to enhance the overall effect. This is very important when you are considering this laser. You may be asked to stop medications that increase your chances of bruising. Feel free to bring a list of questions. We love an informed patient. Dr. Ricciardelli will let you know what to expect before, during and after your procedure and answer all of your questions. What can I expect during and after my laser treatment? Your privacy and safety are very important to us. On the day of your laser you will park in a designated, convenience space in back of the Summit building close to the private back door entrance of our office. Your laser procedure will most likely be performed in our AAAASF (Association for Accreditation of Ambulatory Surgery Facilities) certified operating suite and will take about one hour. After the procedure, you will wake up in our warm and caring recovery suite. Our recovery nurse will make sure that you are comfortable and inform your designated driver when you are ready to return to the comfort of your own home that day. You will be given detailed instructions for your specific needs. Most patients do not complain of pain after surgery but a mild discomfort. On average, most patients are able to return to work in 10 days and begin light exercising in 2 weeks. A lot will depend on your level of activity at work. Expect to have redness, swelling and tenderness after surgery. Dr. Ricciardelli will call you in the evening to check-in on your progress as well as see you back in the office for your follow up care. Our door is always open for any questions. It’s about confidence: confidence in your surgeon, confidence that your wishes and individual concerns will be heard, and confidence you will get the results you want. Dr. Ricciardelli has the experience and reputation that ensures you are trusting in a surgeon with a known track record in the area and the qualifications and certifications that recognize him on a regional and national level.